I have been stuck between the pages of Salman Rushdie’s autobiography and another biography about Jack Kerouac, that I have neglected my cookbooks. We started this food blog to highlight food and culture, and for me that includes books. 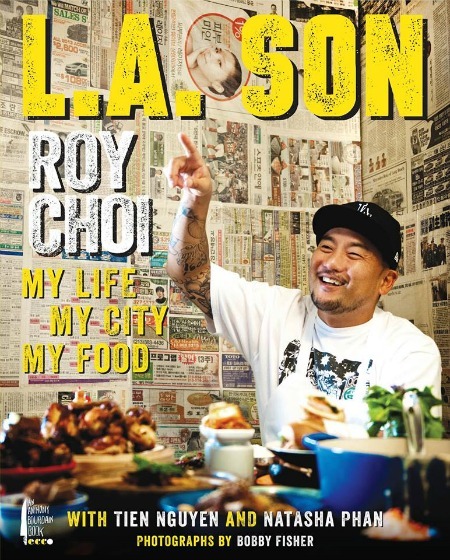 So I snatched up a copy of Roy Choi’s L.A. Son and was quickly absorbed in the book. Part autobiography and part cookbook, it comes in at just over 330 pages and is beautifully done. Clean, well-written recipes and plenty of photographs make this the type of cookbook that should be living in your kitchen, not as part of some dusty library, but as a living, breathing document. But why is LatinoFoodie.com doing a book review? As an Angelino I feel like this is an important book to have, but also as a foodie and culinary school graduate, I feel like I am cooking with a buddy whenever L.A. Son is out on my counter. The book has character, and you can feel the moods and emotions creep into you as you read about Choi’s childhood, the death of a friend, his gambling, and then to his time at the Culinary Institute of America and his externship at one of the best restaurants in the world, Le Bernardin. Stuffed full of adventures and adventurous eating, the book chronicles the growth of his cooking, and the birth of a local food legend. And then there are the recipes. Choi has recipes for buttermilk pancakes, fried rice, crème brûlée, coconut rice and gumbo, but also for pho and Korean fried chicken. All mouthwatering recipes for sure, but he also does not disappoint with his many Latin recipes. Dishes like beef cheek tacos made with a charred tomatillo sauce; carne asada in a 15 ingredient marinade, that includes beer and kiwifruit; horchata made with cinnamon, lime juice and sesame seeds; salsa verde made with fresh Thai basil, cilantro, mint, and tomatillos, and another dish of mushroom quesadillas with caramelized chanterelle and oyster mushrooms. And I cannot forget his recipe for kimchi and pork belly stuffed pupusas. In one passage Choi cathartically relates to the underappreciated soulful stew called birria, and his relation to the goat that gave its life to feed him. I have never made birria before, but his recipe is tight and concise, with the slow cooked goat rubbed and simmered in dried guajillo chiles, dried ancho chiles, fresh jalapeños, cumin, Mexican oregano, garlic, fire roasted tomatoes and brown sugar. Just as Roy Choi felt great triumph at mastering his Potatoes Anna Banana (a type of rustic Pommes Anna served with banana ketchup), I too will seek out that feeling with a birria recipe to call my own. For now, Chef Choi has the floor.